Everyone is talking about it! It’s the plant of the week, the one everyone wants to know and hang out with! My own blog statistics show a dramatic spike in views of past posts written about it! What is this trending plant, the plant with the cool vibe? Well, it’s more than cool, it’s cold–it’s Frostweed, Verbesina virginica. Of course! Frostweed is an excellent wildlife perennial plant, native from all the way up in Pennsylvania to here in sunny–usually mild–Texas. 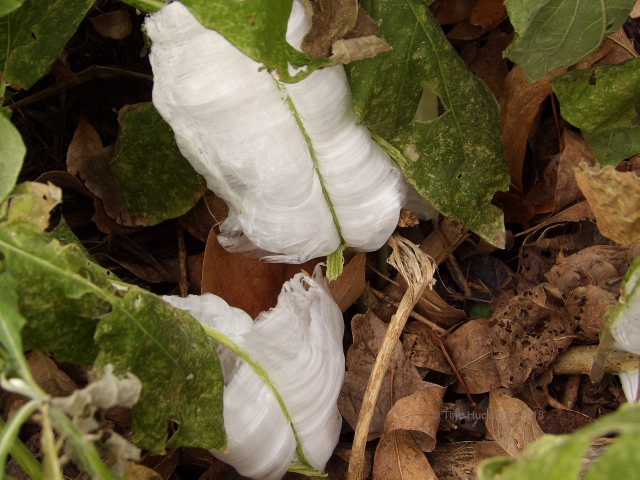 Its striking summer-to-autumn white blooms, which feed many, are quite enough for me to adore Frostweed, but it’s the transitory ice show, as seen during the first hard freeze of winter, that gives this summer and autumn blooming, pollinator-loving perennial its name. 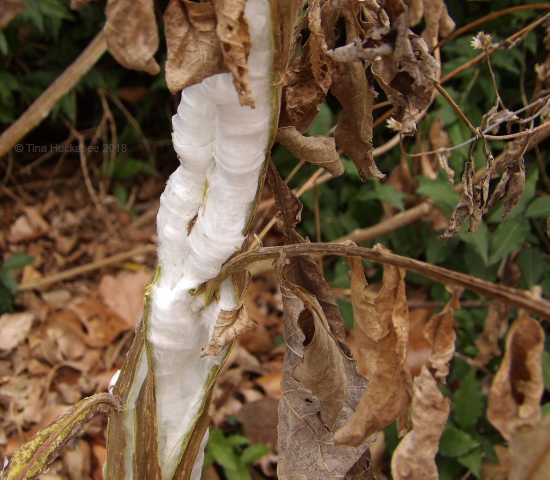 In the first winter hard freeze, this week, my Frostweed strutted its icy, frosty stuff for almost three full days, due to the temperatures dropping late Sunday and not reaching above freezing until mid-day Wednesday. The first thing I thought about on Monday morning, January 1, 2018, (okay, second–the first was about coffee…), was Oooh, I need to check out the frostweed, I’ll bet they’ve all burst open! Indeed, burst open they had–and how! The moisture from the stem blasts open the epidermis of the stalk. 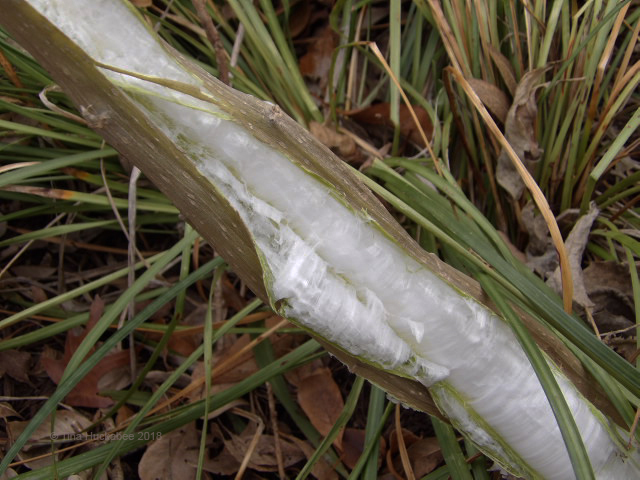 Breaks through the stalk, with additional curling (upper left) of the ice, occurs as moisture, forming additional ice, moves outward. 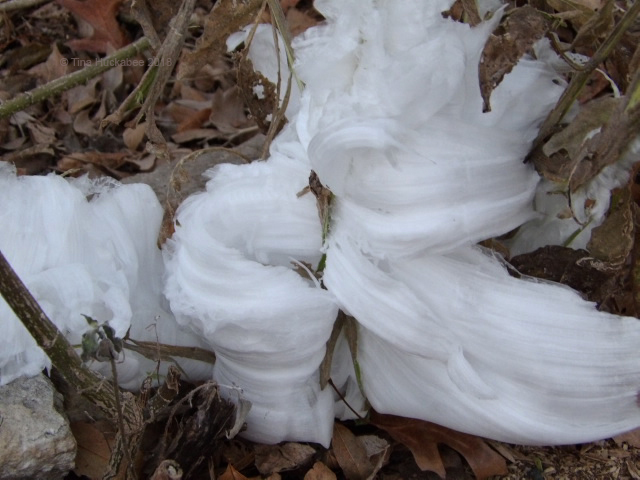 The ice formations are delicate and transient–melting at touch or temperatures over freezing. 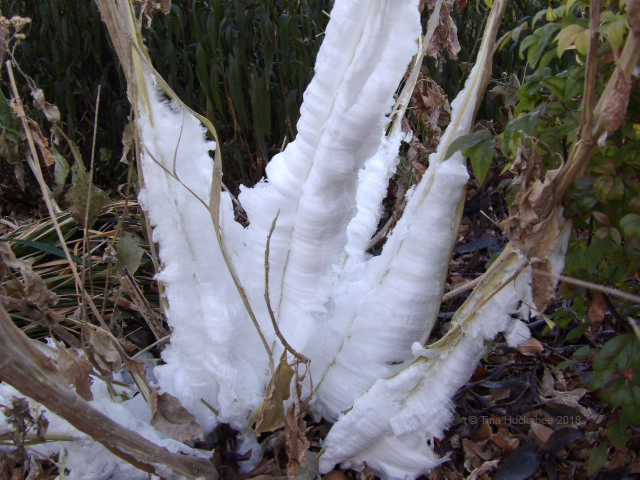 Ice forms as the plant draws moisture up from the ground. 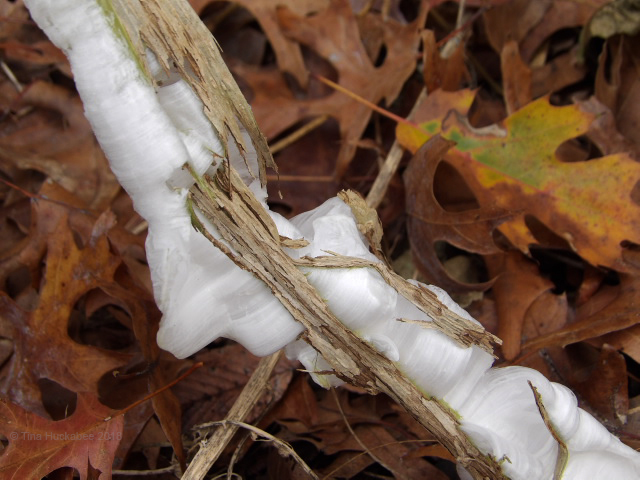 The supercooled moisture breaks open the epidermis, freezing from the base of the plant and upwards along the stalk. 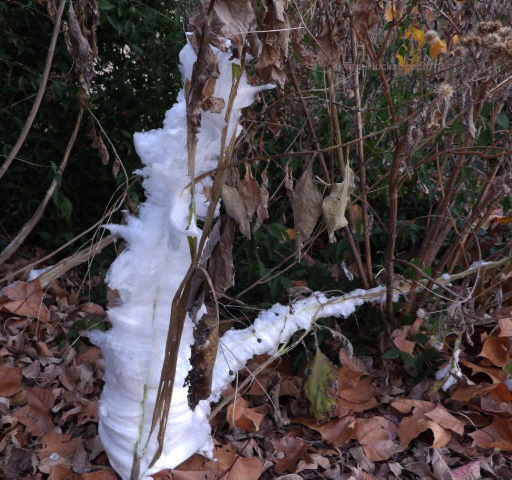 The resulting ice sculptures can furl (unfurl? ), scroll-like, along the stalk, which is how my Frostweed usually behaves. Sometimes, the ice creates wavy, ice-taffy inspired forms. Same plant, Wednesday morning as more moisture froze along the stalk when temperatures continued to drop. This winter’s show was special because in Austin, and certainly in more northern parts of the state, temperatures stayed below freezing for longer than the typical fleeting hard freeze, thus allowing the ice sculptures to expand, and remain frozen for admirers to appreciate for longer than just one morning. Other perennials demonstrate similar freeze-n-bust action, but none do it with the verve and style of Frostweed. As the sun warmed Wednesday afternoon, so melted away the exquisite, frosty art. The frost show ended, probably until next winter, but it was fun to see. Frostweed will be back in spring, after winter’s pruning, for another year of blooms and bust. 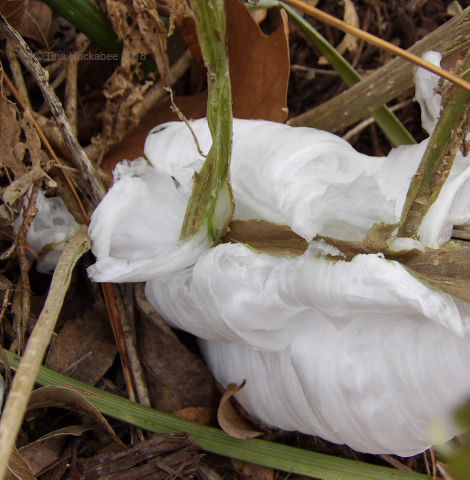 This entry was posted in Frostweed, Frostweed ice sculptures, Uncategorized, Verbesena virginica and tagged Gardening with native plants, Texas Native Plants by Tina. Bookmark the permalink. This is just killing me. I spent four hours over two mornings trying to find some frostweed that had done its thing, and I never found a stem. It was around — I saw photos from the Katy area, and even some in Galveston. But none of the places where I knew frostweed was growing had produced, and some people who have it in their gardens said they didn’t get any, either. I just KNEW I could find some, and didn’t. I was so disappointed — pouty-lipped five year old disappointed! Ah, well. Next year! It’s tricky, this ice making business. The conditions have to be right and the temps lower than 32, falling rapidly. Some years, mine don’t put on much of a show. This year, it was nice, though I’ve seen pictures of remarkable ice sculpturs and mine have never equalled. You’re right though, next year it’ll come ’round again! That is just too weird. Someone had posted a single picture of it earlier. We barely get frost here. Weird and wonderful! I was pleased with the ice turn out and the length of time I was able to admire. Yes, I did not consider how fleeting it would be! You’re welcome! You should have picked those pumpkins and roased them for some soup or nice bread! Awe, thanks shutterbug. I always learn something new, too. I have yet to see frost weed. If there is some in our area, it surely froze as everything else did. Most urban neighborhoods won’t have frostweed, because it’s not a “tidy” plant and I don’t know how available it is in most nurseries. I collected seeds from a garden that I once managed and the rest is history. I do see in in green spaces around Austin, though. That’s so cool! I hadn’t heard how Frostweed got its name before. I think there’s a bunch growing wild around Dripping Springs, but I’ve been home sick with strep and haven’t been out and about to observe this phenomenon. I’ll be on the lookout next year for sure! So sorry you’ve been sick–wishes for a speedy recovery. 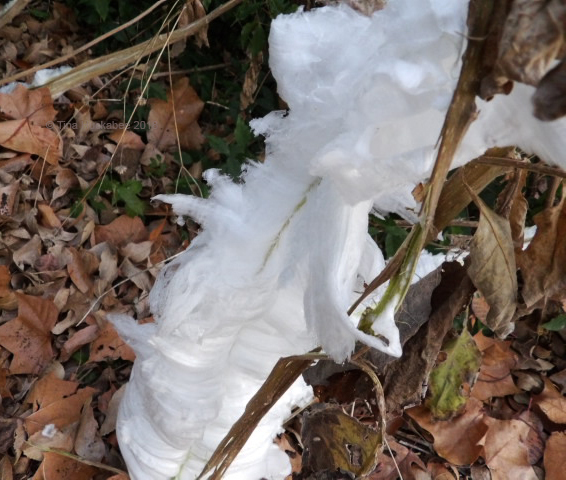 Yes, there would be a bunch of frostweed in your area, but you have to get out at the time of the freeze to see the ice sculptures. You could collect seeds (which are ready, btw) and sprinkle them in your garden and they’d be close by. It’s an easy plant to grow. Get well soon! Your frostweed put on a nice show and I didn’t check mine. Well it was pretty cold out there and I didn’t see anything from the window. Haha–you’re smart to watch from the window. Both days that I got out to take ths shots–brrrr, so cold! Another new one on me! Isn’t it? 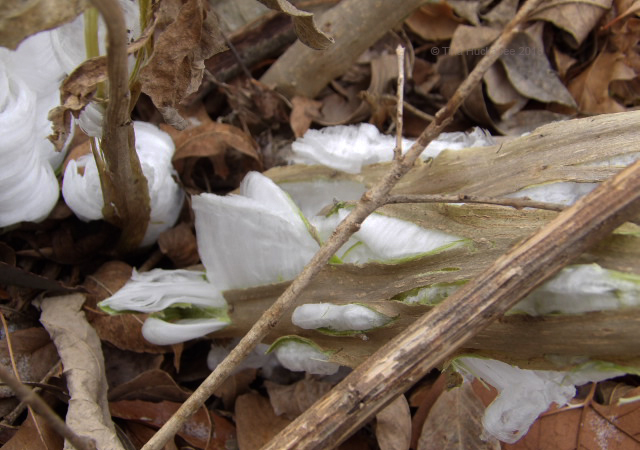 I think there are many plants that explode in ice, frostweed is just the frost queen! Really interesting. Never seen such. Thanks, it is an interesting plant. Tina I remember last year’s Frostweed. But this year has been exceeded. What precious shapes of ice has formed. I love one that falls from the branch to the ground and those that open and form waves. The photos are magnificent. Frostweed is a show! Greetings from Margarita. You’re absolutely right, Margarita–this year’s frost show was much more dramatic than last year’s, or any other year. 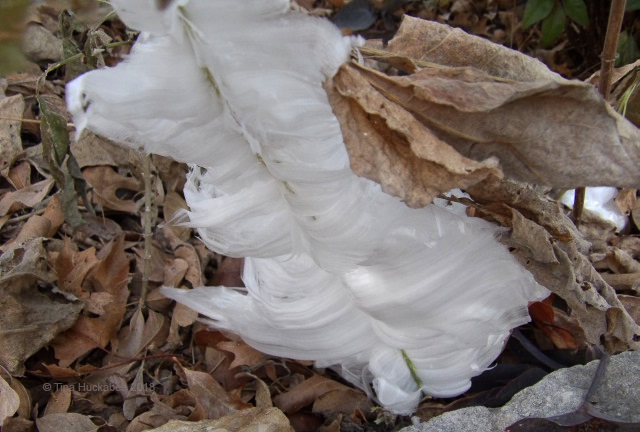 I’ve always seen photos of the undulating frost sculptures on frostweed plants and mine finally showed some of that flair! It’s awesome and so beautiful. We don’t have it up here in Wisconsin, but I love seeing photos, so thanks for sharing. You captured some great ones! Thanks, Beth. The ice sculptures are beautiful–I look forward to what they’ll be each winter, after the first hard freeze. This year’s didn’t disappoint! Fabulous, I’ve never seen anything like it. Isn’t it? I was very happy the ice obliged! What a super-cool plant Tina. I remember you show it some other time and couldn’t believe my eyes. Worth growing just to enjoy the frost spectacle!